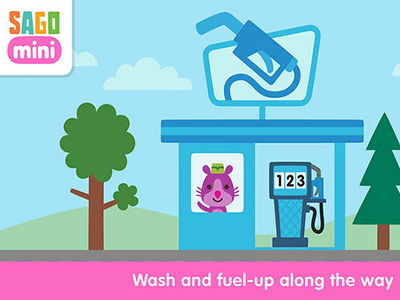 Sago Mini Road Trip lets kids pick a destination, what to bring on the trip and a car to drive. 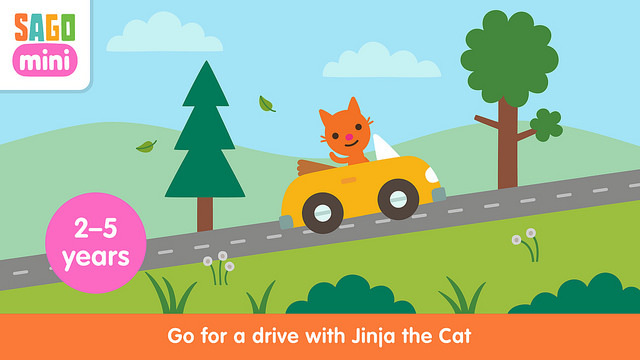 Then it is off, for a fun-filled drive with Jinja the cat. They can stop along the way to wash and fuel up. There are two ways to drive. Tap the right side of the screen to accelerate and tap the left side of the screen to brake. Or just pick up the car with your finger and go. Kids have fun zipping along until they arrive at their destination. A warm welcome awaits them! The app was inspired by the designer’s own experience playing cars with her sons. Crash! She saw driving is a universal theme in children’s play. It’s about speed and action but it’s also a central part of the stories we tell. Where are we going? Who are we going to see? Road Trip captures this spirit with all the natural controls and playful surprises that are key to Sago Mini apps. Like all Sago Mini apps there are no levels or time limits but there is a lot to explore, and great storytelling opportunities for parents and kids. Choosing a car with the character, deciding which luggage to bring, and travel. The interaction of the story is very simple, but the feeling of travelling and collecting al the photos from around the world is simply exciting. This is an excellent app that will definitely broaden children’s creativity.